We have a 90-day no-hassle return policy. We pay return shipping. After 90 days, defective items will still be covered under the manufacturer’s warranty, where applicable. Please refer to the product listing for warranty details. If you have specific warranty questions, contact us at support@at3tactical.com. We may direct you to pursue your warranty claim directly with the manufacturer. If you’re dissatisfied with your purchase, in any way, please contact us at support@at3tactical.com – we will do our best to make it right. Shipping cost is $7.99 for orders under $50. We ship with UPS or USPS, depending on the item. You will receive an email with tracking information at the time of shipment. To expedite shipping, we may ship your order from multiple warehouses. Orders placed on weekends, holidays, or after 1pm will ship the following business day. 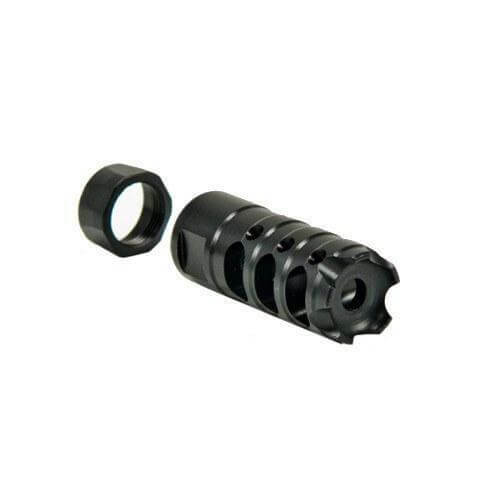 Nitride Heat Treated Muzzle Brake controls muzzle lift and impulse for the best accuracy and an unbelievably soft recoil. Comes complete with a Nitride Heat Treated Collar and five (5) strike prongs. Perfect for AR-15. Nice product and even better price! News, special offers, exclusive discounts, and more!